Human beings have been interested in their appearance for thousands of years. Decorating their bodies with tattoos, piercing ears and other parts of body but also decorating their teeth. Already 2500 years ago were the Native Americans making their teeth stand out with gems. This is a phenomenon that has lasted ever since. Tooth Jewels – Any Harm? Well in the mid-nineties I had my first tooth jewel. I was a dental student when the tiny golden figures for the teeth came in fashion. Heart, star, droplet were the figures to choose from. I chose a heart and it was attached to my upper right incisor with a bonding adhesive they use to bond the filling. For a very long time I was happy with it but then I saw other people who had similar jewellery on their teeth. I thought it looked like people had something stuck on their teeth that needed to be scraped off with a finger nail. It didn’t look like you had golden figure on your tooth and the shape was only visibly in very close distance. I did not want people to think I had food stuck on my teeth – after all I was working as a dental professional already. But then! 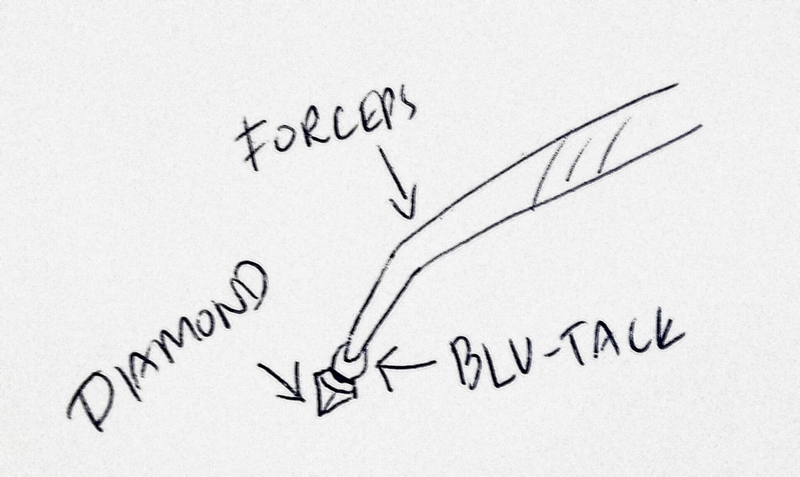 I saw somebody having a diamond on his tooth and I was sold there and then. It wasn’t a diamond inserted on a golden figure or a diamond glued on the surface of the tooth. It was a diamond that was planted inside the tooth – to the level of the surface of the enamel. Let me tell you that this dentist was very inventive and clever. He had found a way to keep hold of the difficult shape of the diamond. The last thing you would need is to see the patient’s precious piece of rock flying past your eyes and on to the floor where you, the nurse and probably the patient would be spending the rest of the appointment bottoms up. Anyway, the dentist placed a small amount of composite filling to the bottom of the cavity he had just made and inserted the diamond to it’s place. Then he light cured it (for non-professionals this means the special light will harden the filling material). So Is There? Harm I Mean? It was in 1997 when the diamond was attached to my tooth and yes, it is still there! Some people notice it, some don’t. Often I forget it is there until someone mentions it. I have never regretted I let the dentist drill my intact tooth to insert a diamond. So to the question on the title – is there any harm in having jewels attached to your teeth. are best to be attached to the teeth that already have filling/s. Do not follow my example! But there are also removable tooth jewellery as well. Read further to find out. You Sure You Want to Look Like a Rapper? you might look like a rapper/jail bird – do you have a habitus to go hand in hand with your new looks of the teeth? About grills. They can pose a risk to your occlusion and cause decay, abrasion (type of tooth wear, see my post about them) and gum problems. It is advisable to wear removable grill only when absolutely necessary. Do not try to glue it to your teeth if it is meant to be removable. Here’s further reading on the subject (honestly, what was Madonna thinking?). The most important thing is to consult your dentist before you do any extensive alterations on your teeth. It should always be a dental professional who attaches the jewellery on your teeth. Also, the dentist should check your teeth and gums. Teeth and gums should be healthy before you take tooth jewel. A tooth jewel will definitely draw attention to your mouth and people might notice your flaming red and inflamed gums instead of the tooth jewel. ← Vaping: An Attractive Option or a Destructive Alternative for Oral Health? You have shared amazing information. I really like it. Thanks for the kind comment! Much appreciated!